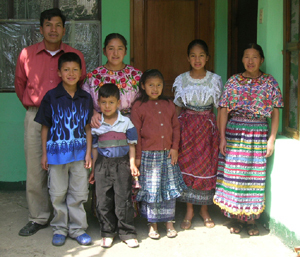 The K'iche' (or Quiché) are one of the largest ethnic groups in Guatemala. They are ethnically Maya and live in the highlands to the north and the west of Lake Atitlán, primarily in the departments of Quetzaltenango, Totonicapan, and El Quiché. Estimates place the current K'iche' population of Guatemala at around 2 million. K'iche' also denotes the traditional language of the K'iche' people. This language is still spoken in most K'iche' communities, but many community members also speak Spanish and some do not speak K'iche' at all. The Popol Vuh, sometimes called the "Maya Bible," gives us an insight into the creation of the first K'iche' and relates the foundation of the K'iche' kingdom. The version of the story that is available to us today was written down in the 17th century by several members of the lineages that had ruled the kingdom until their defeat at the hands of Pedro de Alvarado and his allies. The Popol Vuh tells us that, even before the sun rose for the first time, the first four heads of the K'iche' lineages were modeled from corn dough. They were created with the ability to see and understand everything instantly: "The moment they turned around and looked around in the sky, on the earth, everything was seen without any obstruction," but the gods worried that their creations would "become as great as gods" and limited the clarity with which their works saw. Thus were created the first fathers of the K'iche'. Next, the gods created the four women who would be the mothers of the K'iche' people. Other lineage heads, whose descendants would form the other tribes, were also created in this time before the dawn. The lineage heads then travel east to Tulan Zuyua, where they receive their patron deities. Leaving the city after passing several tests, the K'iche' lords begin their search for a suitable place to establish their kingdom. At the request of their patrons, the lineage heads hide the gods in places where their enemies will not be able to find them, then ascend the mountains to witness the dawn of the sun. As the sun rises, the K'iche's find themselves separated from the other lineages. At this point, the lords begin to assert their dominance over the other tribes in the region. This is accomplished through military prowess and guile. Later, the sons of the first lords return to the eastern city to be given their titles, returning to firmly establish the kingdom that their fathers had originated. They construct a series of settlements, and continue to reinforce their power through military victories. The writers of the Popol Vuh trace the descendants of these great lords through the mid sixteenth century, when they are writing. Scholarship has followed two lines in an effort to establish the origins of the K'iche' people: some scholars assert that there is evidence to suggest that the K'iche' developed as a distinct people in situ while others argue that the journey described in the Popol Vuh reflects an actual migration of lineages from further north who incorporated themselves into local groups to establish the K'iche' state. Their origins notwithstanding, the K'iche' were a distinct people by about 1200 AD. and the K'iche' state was firmly established as one of the most powerful polities in the highlands by 1250. This state was comprised of three different groups, called the Nima K'iche', the Ilocab, and the Tamub that were allied under the leadership of the Nima K'iche'. The Nima K'iche' established their capital at Utatlan (also called Gumarcaaj) around 1400 and the power of the K'iche' continued to expand quickly, encompassing an extensive territory and large population. By 1470, the K'iche' kingdom began to experience occasional revolts by its conquered subjects. Around the same time, the neighboring Kaqchikel kingdom, a former ally of the K'iche', began a campaign of expansion. Conflicts between the K'iche' and Kaqchikel were ongoing upon the arrival of Spanish expeditionary forces. The K'iche' first made contact with the Spanish conquistadors in 1524, with the arrival of an expeditionary force led by Pedro de Alvarado. Following the CIA sponsored overthrow of Jacobo Arbenz in 1954, Guatemala entered a 36-year civil war between government counter-insurgency forces and leftist guerrillas. Tensions rose during the 1980s and the violence of the war escalated dramatically under the presidency of Ríos Montt. Guatemala's indigenous peoples were largely caught "between two armies." Rigoberta Menchú, a K'iche' woman from Chimel in the department of El Quiché, became internationally famous following the publication and wide distribution of the book I, Rigoberta Menchú in 1983. The book chronicles how Menchú's "conscience was born" as a result of her experiences during the violence of the war and her work with clandestine groups to oppose the brutality of the government forces. Menchú was awarded the Nobel Peace Prize in 1992 and despite a widely publicized debate regarding the truth of her account, triggered by anthropologist David Stoll, she remains an important figure in the international arena of indigenous rights. During this same period of civil war, K'iche's in Quetzaltenango began a movement of cultural revitalization. Focusing on projects to promote Maya languages, religion, and culture, the Pan-Maya Movement has since grown to include Mayas of many different ethnic groups from across Guatemala and southern Mexico. Throughout the highlands of Guatemala, the municipio acts as the basic unit of ethnic identity. Each municipio is composed of an administrative center with satellite settlements, or aldeas. Municipios are generally distinguished from one another by slight dialectical differences as well as clothing and weaving styles and are physically separated by mountains. Many modern municipios are in areas of heavy pre-Hispanic settlement, but others are a result of the colonial reducciones. Lineages continue to play an important role in religious ritual as well as everyday life. The K'iche' have traditionally relied on a form of swidden agriculture in which they cultivated maize (corn), beans, and squash in fields called milpas. Milpas are still common today in a somewhat modified form, but K'iche's now also grow wheat as well as flowers and vegetables for export. Sheep are important to the local economy, as are artisanry and the local marketplace. Many individuals also find work outside of the community in Quetzaltenango, Guatemala City, or "El Norte." The traditional form of plant husbandry throughout the Maya region is called milpa agriculture. A milpa is a small plot of land used to grow maize (corn), beans, and squash. This form of agriculture has a number of benefits. In the field, the corn provides shade to the squash and a stalk in which the bean plants can climb. Each plant also returns nutrients to the ground that the other two use, so the land is productive for much longer than it would be if it were only used to grow one type of crop. What is more, these three plants together provide nearly all of the nutrients needed by the human body. Milpas are still very common around K'iche' settlements, but a number of changes have occurred over the years. Many families now grow only corn in their milpa. It is also much less common to let a plot lie fallow between plantings. Most families no longer own enough land to produce all of the food that they require, and many people have turned to other avenues to provide for their families. Many K'iche' men and some women travel to "El Norte" (the north) to seek work in the United States. They typically move to areas where others from their town have gone and work as physical laborers for construction companies or picking fruit and vegetables. They send a portion of the money that they earn to their relatives who remain in Guatemala, who use it to buy food, improve their homes, or make other purchases. It takes several years to earn enough money to pay off the expenses that are incurred on the journey to the United States and several more to earn enough money to return to their homes in Guatemala. Many men are unable to return home for many years and others never make the return journey, having died or made a new life for themselves. Others find good fortune and are able to return to their families with a new vehicle and enough money to create a new life in Guatemala. After returning, it is common for a family to start a small new business. They might open a store in the front portion of their home; purchase a bus to carry people from town to town; or start a small mercantile company, shipping goods in a truck bought in "El Norte." Traditional Maya religious custom, or costumbre, is a syncretic conglomeration of pre-Columbian traditions and Catholicism. It combines devotion to the Catholic saints and celebrations of the Catholic festivals with traditional dances and elaborate ceremonies conducted at ceremonial sites that are scattered throughout the surrounding mountains. Evangelical Protestantism has become increasingly strong since its arrival in the region in the 1970s. ↑ Dennis Tedlock suggests that this name might refer to either Kaminaljuyú or Copán; see Tedlock 1996: 45-47. ↑ Robert M. Carmack and John M. Weeks. 1981. The Archaeology and Ethnohistory of Utatlan: A Conjunctive Approach. American Antiquity 46(2): 323-341. ↑ David Stoll. 1993. Between Two armies in the Ixil Towns of Guatemala. ISBN 978-0231081832. ↑ Thomas T. Veblen 1978. Forest Preservation in the Western Highlands of Guatemala. Geographical Review 68(4): 417-434. This page was last modified 01:18, 3 December 2010.